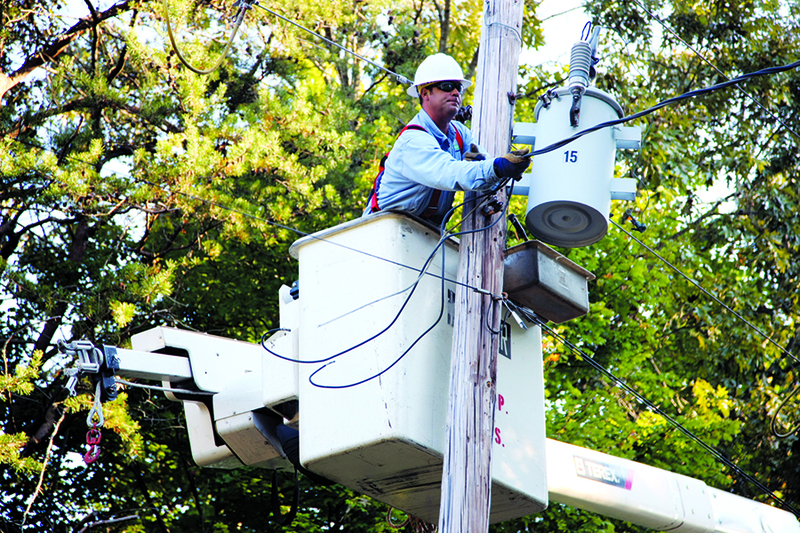 The equipment and devices vary from utility pole to utility pole, but think of a utility pole as a layer cake, with the electric equipment at the top. 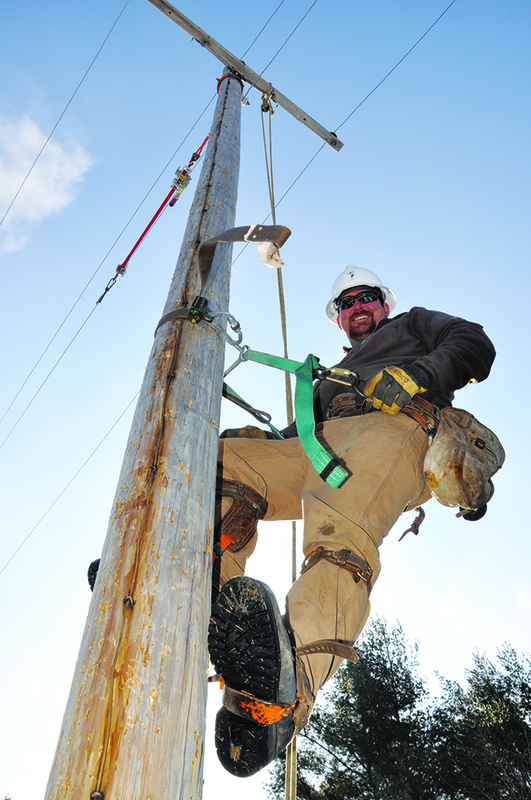 Have you ever wondered what’s on an electric utility pole and how they get power to people? Let’s go over the basics. 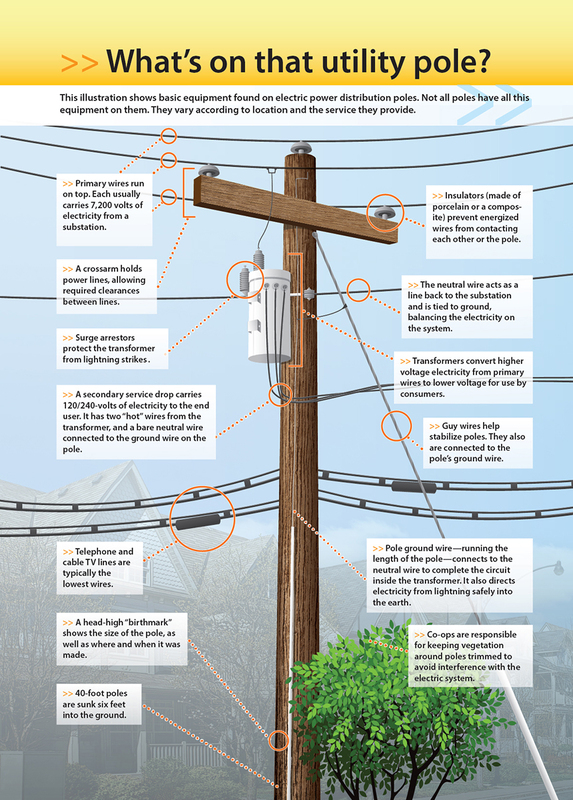 Utility poles are packed with electrical devices, so it’s best to stay away from them. You should never nail posters of political candidates or lost pets to utility poles. Nailing or attaching things to utility poles can tear a lineworker’s protective equipment, interfering with their safety while on the job. Never nail posters of political candidates or lost pets to utility poles. They can tear a lineworker’s protective equipment, interfering with their safety while on the job. The equipment and devices up there vary from pole to pole, but think of a utility pole as a layer cake, with the electric equipment at the top. Most noticeable, of course, are the wires, supported by the crossarms and/or insulators. At the highest levels, they could be high-voltage transmission wires carrying power long distances. More often, what you’re looking at are medium-voltage distribution lines carrying power into neighborhoods. Beneath those may be service wires with stepped-down power ready to be used in a home or business. It’s important to remember that those are bare wires, which is why you hear regular warnings to stay away if a storm knocks power lines to the ground. That’s also why the wires are attached to insulators that keep them from being in contact with the wood, steel or other supporting materials. Just below the electric lines hangs a variety of electric equipment. The big metal cans are transformers that convert high voltages to low voltages. Devices that look like stacks of big gray doughnuts could be protective lightning arrestors (or reclosers) that act like a fuse or circuit breaker, shutting down the line when they detect a problem. Collections of what look like metal cereal boxes are capacitors that help improve the efficiency of power flow and regulate voltage. Other switches and regulators monitor and adjust the flow of electricity as energy use changes throughout the day. Some of the lines you see might be ground wires that carry static electricity (such as lightning) into the earth or balance the flow of power and help ensure safe operation of the system, or they could be guy wires to keep the pole straight. The lowest layer carries nonelectric lines: cable TV, telephone, internet and traffic light controllers. Always assume that any downed line is energized and dangerous. Call 911 if you see one. Any of the lines might also be located underground to get to a house or meet up with other underground lines.